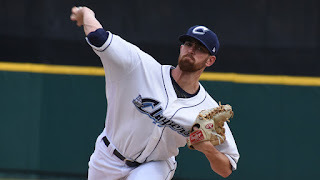 Shane Bieber debuted for the Cleveland Indians last week, as did Dennis Santana for the Los Angeles Dodgers. The first time through the Minnesota Twins lineup, Bieber allowed one hit while striking out 3 and of course, didn't walk a batter. The next time up, hitters were 4-8, including an Eduardo Escobar double on an 0-2 pitch, and the Twins scored two runs in the 5th inning. Bieber came back out for the 6th inning, and got two quick outs before Logan Morrison and Escobar hit back to back home runs and Max Kepler singled before Bieber was removed from the game. Santana did not start the game for the Dodgers, as Los Angeles used Scott Alexander as the "opener". Santana entered the game in the 2nd inning, with one out. He got Ian Desmond to line out to shortstop, but things quickly fell apart. Chris Iannetta hit a double, Santana hit the opposing pitcher, DJ LeMahieu singled and the Charlie Blackmon tripled before Nolan Arenado lined out to center to end the inning. The next time he took the mound, Santana set the Rockies down in order, striking out Carlos Gonzalez. In the top of the 4th inning, Dennis Santana (a converted SS) hit a bases loaded double, scoring two. Santana would pitch 3.2 innings, allow 5 earned runs and strike out four batters. Bieber was sent back down to AAA-Columbus but Santana will get another "start" on Thursday, against the Pittsburgh Pirates. After dominating minor league hitters, the St. Louis Cardinals called up Alex Reyes for a start against the Milwaukee Brewers, but that ended after just four innings. Reyes was returning from Tommy John surgery, but that is not why he was pulled from this one. He is now dealing with a lat injury that will force his to miss "significant time." The Cardinals, who already feature Jack Flaherty in their rotation, have Ryan Helsley looking MLB ready since being promoted to AAA-Memphis. Helsley made 7 starts at AA before the call up and over four AAA starts has pitched 23.2 innings with a 31:7 K:BB ratio. Dakota Hudson isn't far behind either! Carlos Martinez is working his way back from an injury and Adam Wainwright isn't even eligible to return from the 60-day DL until the middle of July. Miles Mikolas and Michael Wacha (almost a No-No!) have been leading the Cardinals pitching staff as of late, while Luke Weaver continues to figure things out.